Anticipate operational impact based on performance data trend and analysis. Easily monitor departmental performance and focus on those areas most in need of your attention. 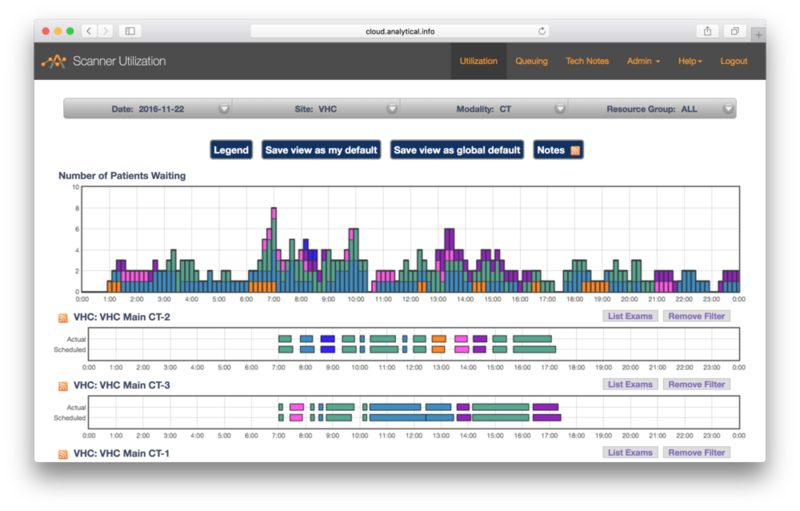 Improve operations with real-time data to support your decisions. Intervene as needed and become truly data driven. Identify patterns and quickly explore your practice, finding opportunities to improve efficiency, quality and patient care. There are many events happening in your practice at each minute of each day, with patients, physicians and clinical staff interacting across facilities. Keeping track of operational challenges and identifying areas of opportunity can be difficult with so many data points to consider. Quality helps you easily discover operational patterns and identify areas of opportunity for quality improvements. Finding a way to quickly drill down into the detail of an operational question is essential to make informed decisions quickly. Determine whether a problem is impacting a single location or multiple facilities, one or many providers, and is a new phenomenon or part of a trend. Look for and understand what’s happening in your operations from the global overview across years to a single patient experience in real-time. Radiologists dictate thousands of reports each year but searching through those reports for decision support, quality improvement, research or education purposes can be a difficult task. Finding a specific phrase or diagnosis can often take days or weeks. 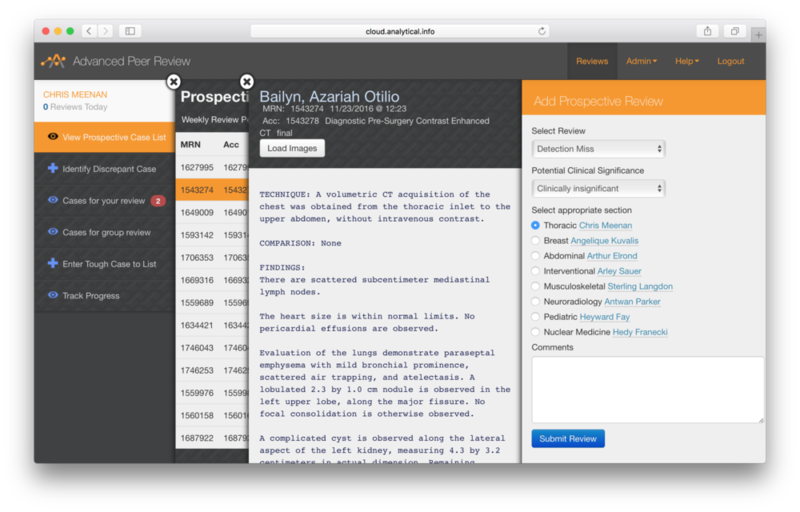 Report Search lets you easily search millions of report records in seconds across disparate EMR to find difficult cases, unusual diagnoses, or identify trends in reporting. Hospitals invest significant capital and operating resources to provide medical imaging services, but typically have few tools to make sure these resources are being used optimally. Easily view patient waiting in real time and look for opportunities to improve patient experiences with shorter waits or improved scheduling. Trainees typically receive ad hoc feedback from attending physicians related to diagnostic report accuracy, but can struggle to understand overall diagnostic performance across multiple years of training in various subspecialties. Look for patterns of changes to trainee reports including percent change and specialty. Provide closed loop, real-time communication where direct feedback is required. Allow trainees to solicit feedback and access their own case logs. Beyond a simple compliance initiative, participate in an Advanced Peer Review process that directly impacts patient care. Create peer reviews that match your specialty and are delivered in time to impact care. Help mentor junior physicians with directed feedback on detection and interpretation improvements. Identify nonrandom reviews easily and request over reads for tough cases or for team review. For more information visit www.analytical.info/peerreview. A real-time view of undictated studies across facilities and disparate information systems, Sweep provides an up-to-the-minute review of dictation and signing status for diagnostic reports. Look for outliers and easily identify diagnostic reports that have not been successfully delivered. Improve compliance and determine clinical impact quantitatively by age of outstanding results. Tracking recommendations for follow-up imaging or for other clinical terms contained in diagnostic reports can be a tedious, manual process. Automatically identify recommendations in diagnostic reports and create a checklist for appropriate follow-up to help your department more easily track recommendations made by radiologists. Create cohort analysis for improved discovery and communication. Document communication and workflow steps for quality process improvements. Providing an easy way for radiologists to submit image quality issues to advanced imaging managers, Reflect is a simple, closed-loop communication process to facilitate communication across your health system or across the world. Effortlessly visualize patterns and identify opportunities for quality improvement with access to valuable data to support management improvement plans. Truly measure and improve your image quality. Some operational issues can’t wait until morning. Receive real-time alerts based on pre-defined criteria to address delays or staffing issues and ensure service levels are optimized. Reduce time to response for critical business processes and receive up to the minute information directly to your mobile device, with the flexibility of supporting complex on-call team schedules. Data quality is a journey, but Service Tools makes it easy to handle numerous physician identifiers, new resources and new procedures across one or many EMR. A one-stop shop for keeping your AI Bridge platform running at peak performance, look for data element change histories or easily review timestamps and audit actions. Review data quality management worklists easily with our comprehensive platform management tool-kit.